My Guardian Demon tells the story of two remarkable artists. Separated by the Iron Curtain, their twenty-five year correspondence, occasionally censored, gives an intimate view of their unique bond. In their letters that were funny and sometimes brutally honest Halina and André shared a consuming love of music and literature and a fascination with the foibles of human nature. Arthur Rubinstein said of André, ‘I think André Tchaikowsky is one of the finest pianists of his generation – he is even better than that – he is a wonderful musician.’ Yet André’s professional passion was composition. In 2013, three decades after his death, André’s opera The Merchant of Venice was premiered by David Pountney at the Bregenz Festival gaining international recognition. ‘You know that Rimbaud is my guardian demon’… were André’s words in a letter of 9 October 1978. André’s homage to his alter ego and their shared dark side led him four years later with sardonic wit to donate his skull to the Royal Shakespeare Company. It was subsequently used in performances of Hamlet starring David Tennant. 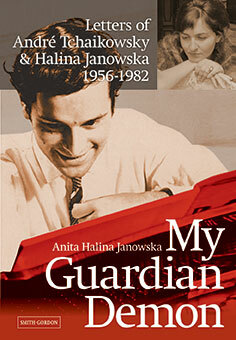 Author Anita Halina Janowska has journeyed from musical conservatoire to a PhD in criminology and a career as a writer. In Poland My Guardian Demon (…mój diabeł stróż) has achieved three editions and cult status making André Tchaikowsky a household name. Margaret Ramsey’s memoir of her prodigious brother shows Frank Ramsey as clearly as if it were yesterday in the surroundings of his family, fellow scholars and friends. The life of an exceptional man is played out before our eyes against a background of a time that is now ‘another country’ but strangely linked in its manners and concerns to our own. A brilliant mathematician and a philosopher who belonged to the Cambridge of Moore, Russell and Wittgenstein (whose Tractatus he helped to translate while a student), he was the innovator of a new subject of economic philosophy, challenging Keynes on probability and contributing to taxation theory. Frank Ramsey 1903-1930 is not only the extraordinary story of a young genius. Margaret Paul brings to life an age – the twenties, a decade of interwar angst, both Freudian and political, and with it a roll call of exceptionally gifted men and women. The preoccupations of that time call out subtly to the world of today. Available from bookshops and Amazon. To order directly from the publisher email dgibbons@mimeo.com or telephone David Gibbons on 01480 410410. When a horse wears blinkers there can be a winning advantage. Straight to the finishing line without distraction. For mankind, blinkered concentration on the path ahead can bring individual success. A period of world history or a nation’s culture may appear to be predominantly rich in literature, art, music or science. Nevertheless the best chance for the future is a good education bringing the humanities and science together with the desirability of this being heightened among those individuals who form democratic governments. In Britain and other Western democracies education appears to be less effective than in other competing economies. Blinkers – scientific ignorance and evasion takes C P Snow’s idea of the two cultures and suggests that not only do we need a single culture in order to meet the challenge of the future but that we need to ensure science has its rightful part in good education and in our ideas of what our culture should be. Pasternak describes how science is particularly undervalued in Britain and how in the United States science competes with irrational ideas to form judgements and decisions. How many scientists sit in British cabinets or are influential participants in US governments? Blinkers – scientific ignorance and evasion removes the blinkers from our eyes. We may pay lip service to science but do we accept the need to place it at the heart of education so that it becomes natural for politicians and leaders to be well equipped to understand the world we live in? The Fellowship of Women celebrates women surgeons in this FRCS anniversary year. Mrs Ghilchik recounts the freedom they claimed to work as independent professional women in society and tells of their friendships and cooperation with each other and how they overcame the obstacles in their paths. Fellowship of the Royal College of Surgeons of England. You might think that the two groups – the undernourished and the overfed – are geographically distinct: the former live in the least developed countries (particularly those in Asia and Africa), the latter in the most developed countries (particularly those in North America and Europe: one in three within the USA is overweight). But you would be wrong. Although the majority of undernourished people indeed live in the least developed countries, and the majority of overweight people live in the most developed countries, there is surprising overlap between the two categories. Thus some 30 million people in the developed world live in poverty and go hungry on a daily basis, while >10% of women in sub-Saharan Africa, almost 40% of women in Latin America and the Caribbean, and nearly 50% in the Middle East and North Africa, are overweight. The authors describe obesity as a complex problem. As such they insist on the diverse conditions that form ‘The obesity culture’. Good methods of research and a central role for education and community participation may best meet the public health challenge. Obesity and overweight, as hazards for the health of all, and widely manifested as a particular threat to the less economically well off and minority groups, form an outstanding example of the complex problems of today’s global society. Money alone and prescriptive solutions clearly do not work. This is the second book recording more than a decade of cooperation between the Jordan Higher Council for Science and Technology and Durham University, UK. The work of the Badia Centre brings together research leading to an understanding of the geographic conditions of life in the arid Badia region that comprises 80% of Jordan. These studies match the aim of developing natural regional resources and preserving local human, animal and plant cultures.